Yes, we’re still in France. No, there haven’t been many blog postings from this summer’s cruising. Sorry about that. As with so many things in France, our intentions are noble but the distractions, and justifications, are just so, well, so distracting. We are within a few days’ travel of completing the loop we’ve been motoring on since early May. 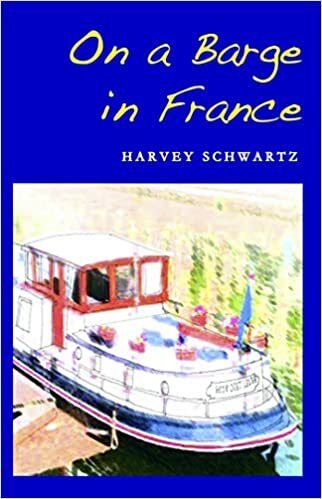 As you may recall from earlier episodes, in May the spring rains marooned us between a swollen River Soane to our stern and a collapsed wall on the Canal du Centre, in southern Burgundy, at our bow. We suffered through that three-week ordeal by visiting the surrounding vineyards and stocking up on ballast: white, red and rose’, for the boat and ourselves. In a moment of temporary sobriety, or satiation, we executed a demi-tour, a U-turn, on the canal and abandoned our east-to-west passage, opting for a counter-clockwise (anti-clockwise in Brit-speak) circle this summer. By now – exactly 350 canal locks later – we’ve come almost full-circle, to the point on the Canal where the wall collapsed in May. Cruising the Loire Valley region. How we spent the past six weeks. This summer’s lesson is that France is so much more than Paris. In fact, France and Paris are two separate, distinct experiences, as different as New Mexico and New York. You’ve no more experienced France if you’ve only been to Paris than you’ve experienced the United States if you never strayed beyond Times Square. Even if you also dropped in at Disneyworld. If you’ve never been to Paris, drop everything and go there, along with the million or so other tourists who will elbow you in the ribs to glimpse the diminutive Mona Lisa. But our advice is that once you’ve seen Paris, escape it and see the rest of France. That’s what the French do. The Loire is a fine place to begin seeing Not-Paris, France. The Loire is the Mississippi River of France, its longest river but not its friendliest for boats. There was a long period in which the Loire was so difficult for boats that the practice was to cobble together wooden barges well up the river, fill them up with stuff to sell in the big cities, float them down the river, then break the boats apart and sell them as firewood rather than try to drag them up the shallow Loire. Technology intervened to end that practice when the Canal du Centre – connecting central France with the Loire – was opened in 1793. Things got even better when the Canal Lateral a la Loire – the canal alongside the Loire – opened in 1838. This canal allowed boats to pretty much avoid the sandy Loire entirely and, connecting to the older Briare (1642) and Loing (1660) canals, opened the door for Burgundy wines, among other products, to float to the Seine and on to Paris, and for the barges to float back again. We took advantage of this high tech technology dating from 1642 to 1838. It was startling to realize that we were being lifted by canal locks built fifty years before the folks at home in nearby Salem, Massachusetts got around to hanging the town’s witches. Many of these locks use the same technology as when they were built: somebody – also-known-as-Sandra on our boat – pushes, pulls, lifts or turns a lever, an arm, a crank or a wheel that lifts, drops, opens or closes the doors at either end of the lock to fill it with water or let the water out. No motors involved. The chateau at La Bussiere, near Gien, was owned by a noble family that included generations of obsessive fishermen. Room after room after room after room of the present version of the chateau is, pardon the term, stuffed to the gills with fishing ephemera. Every version of fishing rods cast by fishermen from Cro-Magnon to Hemingway. In fact, there is a stuffed coelanthis, a prehistoric fish long-thought extinct, but not quite so. There is specialized fish-eating cutlery and plates, again, through the ages. Fish art covers the walls. Fish cooking items fill the chateau kitchens. And, naturally, or actually, not at all naturally but rather man made, the entire chateau is surrounded by a lake that to this day is stocked with fish and fished regularly by French prime ministers, sometimes by simply dangling a line from the porticoed balcony overlooking the lake. There’s a great little restaurant in town, too, l’Insolite, inexpensive and worth the visit in itself. We had the fish menu of the day. La Bussiere, a castle with its own fishing lake. At the other extreme was the fortress-like chateau at St. Brisson sur Loire, near Briare. We saw a poster advertising a demonstration of machines de guerre of the Moyen Ages in the castle moat. Not something to be missed. A guy event if ever there was one, which pretty much describes the whole Middle Ages (which were sort of humanity’s mid-life crisis, with inquisitions and crusades instead of blondes and sports cars). This was Harvey’s reward for being dragged to view hundreds of murky oil paintings of saints and angels. We mounted our bicycles, pedaled up the hill on which the chateau was perched – nobody built castles anyplace down low – and arrived in time to see a troop of five men dressed in yellow and red robes, iron helmets on their heads, chain mail on their chests, pikes upon their shoulders and, perhaps a drop or two of wine in their bloodstreams, march across the drawbridge and down into the moat. Arranged in the moat was a collection of devices for, to put it simply, throwing heavy stuff. Catapults. Trebuchets. Even a rudimentary cannon. Accompanied by much shouting, foot stomping, marching about and counting down in French, along with heads-up warnings to somebody hidden away far down the hill and through the woods, these Monty Pythonesque warriors loaded boulders onto the devices’ various slings, pockets and boxes and launched them, not quite into orbit, but a long, long way into the unseen distance, accompanied by thuds and crashes and broken branches down the hillside. The catapult took teamwork and was not very accurate. Click to watch the video. A narrator told us the the trebuchet was used not only to toss stones against castle walls, but also to “return” prisoners and peace emissaries over the walls. And the occasional diseased cow. The trebuchet is the dream project for guys, a machine to toss heavy things a long, long way. Click to watch it in action. Inspired, Harvey is recruiting like-minded Ipswich-ites to build a trebuchet as a winter project. The Trustees of Reservations, owners of the “chateau” at Castle Hill at Crane Beach, should be warned. It’s a guy project. Other non-chateau architectural wonders presented themselves on this canal loop. Although the canal traveled alongside the Loire for most of its way, the canal actually crossed the river at times. In earlier days the river crossing was dependent on (1) the river having enough water for boats to cross and (2) the river not having too much water for boats to cross. 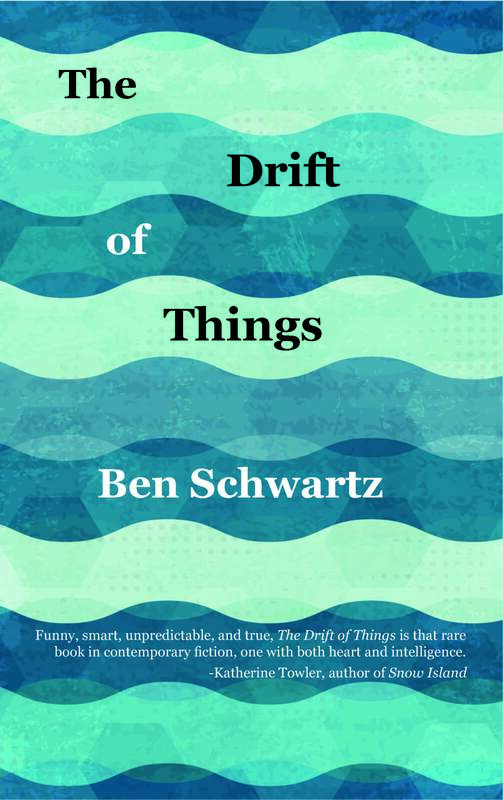 The too-much-water and too-little-water states often blocked navigation for weeks. The solution was to build bridges across the river, bridges for boats. 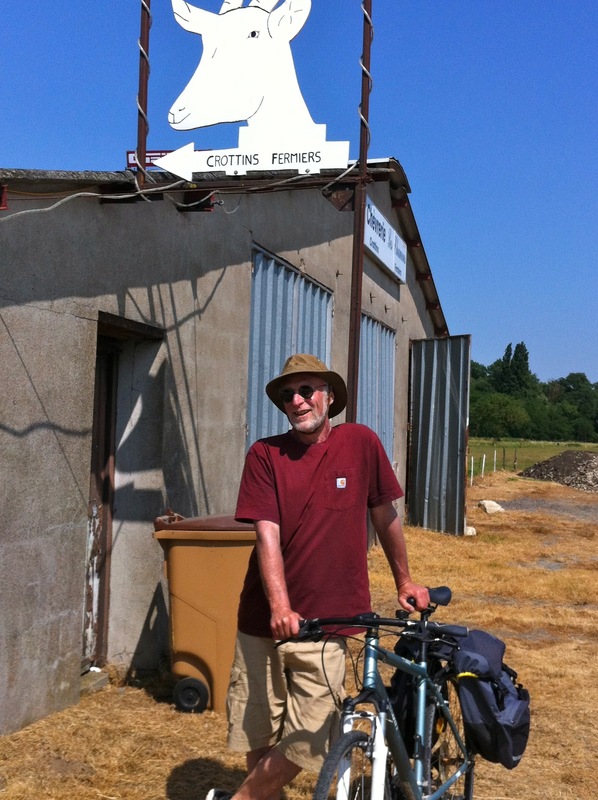 We motored the barge on bridges over the Loire in two places: Briare, at one end of the canal and Digoin at the other end. For you Bostonians, picture the Tobin Bridge with a long bathtub rather than a roadway and a 70-foot barge rather than cars and trucks motoring down the bridge. No tollbooths, though. 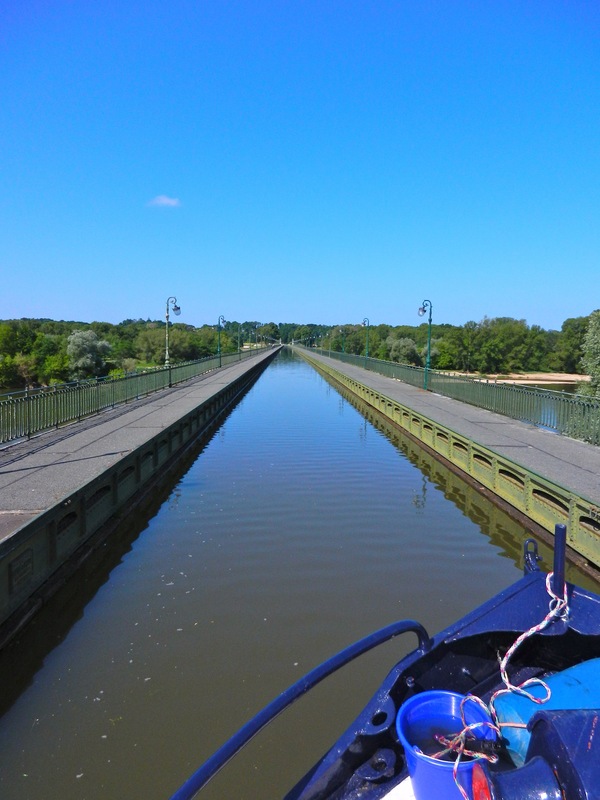 The pont canal at Briare is a 682 meter (almost a half-mile) tub, designed in part by the ubiquitous Gustave Eiffel, on which we motored over the Loire River. At the other technological extreme from 350-year-old canals were a couple of French nuclear power plants located scenically canalside. Some places we’d tie up for the night charged a token amount for us to plug in to electricity. Moorings at nuclear sites gave it away free. 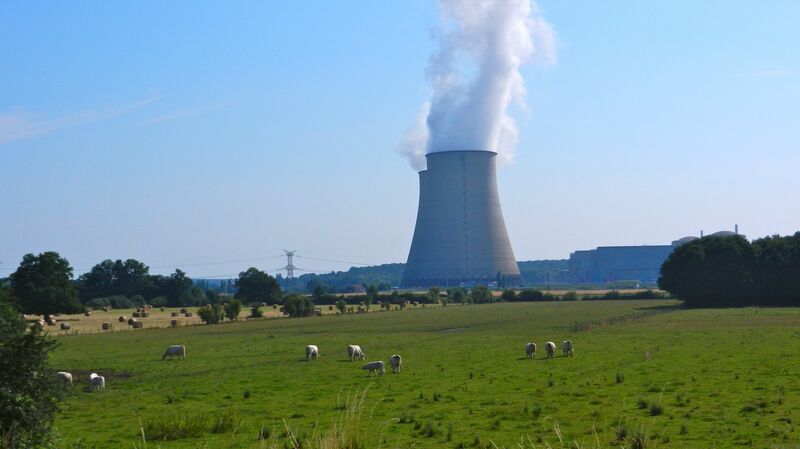 France gets 79 percent of its electricity from nuclear power, a greater percentage than any other country. There is absolutely no relationship between the ubiquity of nuclear plants and the odd circumstance of it never seeming to get totally dark at night anywhere we’ve moored. These pastures adjacent to the reactors adjacent to the canal might be the source of the milk sold at French markets that never has to be refrigerated and never goes bad. The Loire, as with most regions of France, offered its local food and cheese and wine. The medieval town of Sancerre, naturally located at the top of a steep hill, was surrounded by vineyards making white wine of the same name. We rode our bikes to the base of the hill and then chained them up, daunted by its steepness. We asked at a bar whether there was a footpath up the hill. The proprietress walked us to the edge of the woods and pointed upwards. As we set off up a narrow dirt path we heard her shout a warm “bon courage” to us. We found a vineyard located a bit lower down the slope to make our purchases. 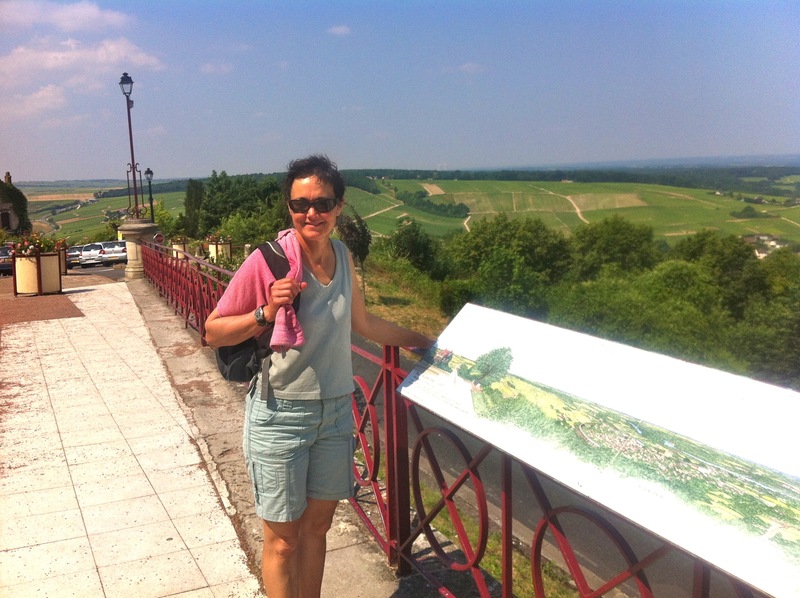 Sancerre, with both vineyards and fortifications, has twice the reasons to be on a hilltop. Nonetheless, when the Catholic king conquered the Protestant city, as punishment for having to climb the hill he ordered all the church bells melted down. The region is known for its special goat cheese, Crottin de Chavignol. Goat cheese and honey from the farmer. Who could peddle past a sign like this without dropping in for a taste and a purchase? We dropped in at several farms when we’d see goats in the fields, knocked on doors and left with small rounds of farm cheese, just hours old, and Crottin de Chavignol, aged at least ten days. 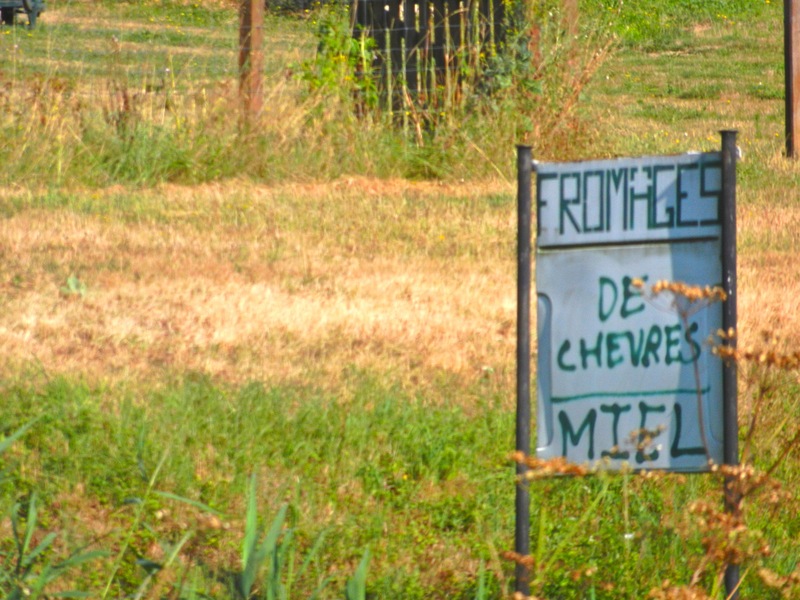 We couldn’t pedal past a farm selling goat cheese, especially the local Crottin de Chavignol. The vineyards at Pouilly-sur-Loire were also located on hilltops. It was fun to compare the Pouilly Fume wines we bought at Pouilly with the Sancerre and the Chablis we’d bought at Sancerre and Chablis. In France, the brand name is the name where the item is produced, sort of like Boston baked beans coming from Boston. The Loire has its share of churches, cathedrals, basilicas and religious sites. 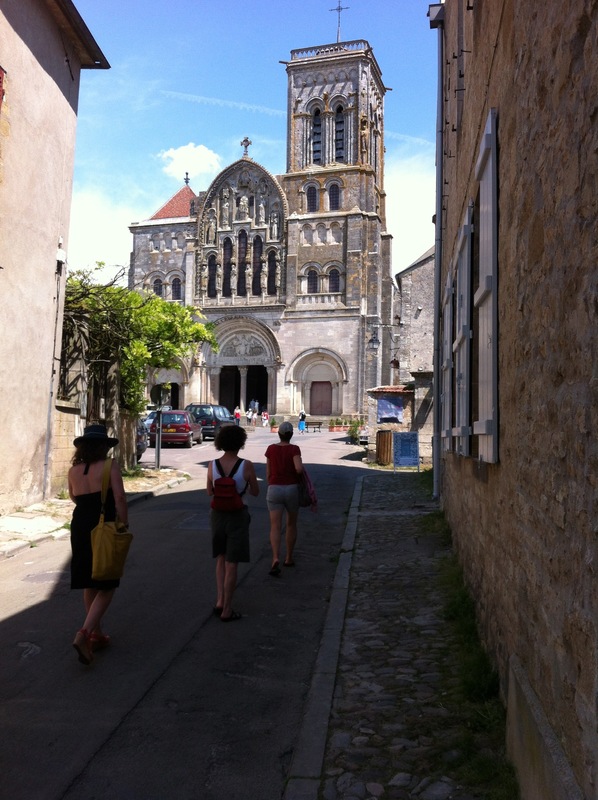 The Basilica of St. Magdelene at Vezelay is a UNESCO World Heritage site and, for almost 1,000 years, a destination for medieval pilgrims, now known as tourists. Our sincere young Audrey Hepburn look-alike tour guide at the cathedral at Vezelay, after pointing out the statues of “alien beings from other planets” on the church entrance, told us how fortunate we were to visit on the one day each year the gold box containing a 12 centimeter piece of Mary Magdalene’s rib was removed from the crypt below the church. At least they are pretty sure it is really her rib, the guide told us. 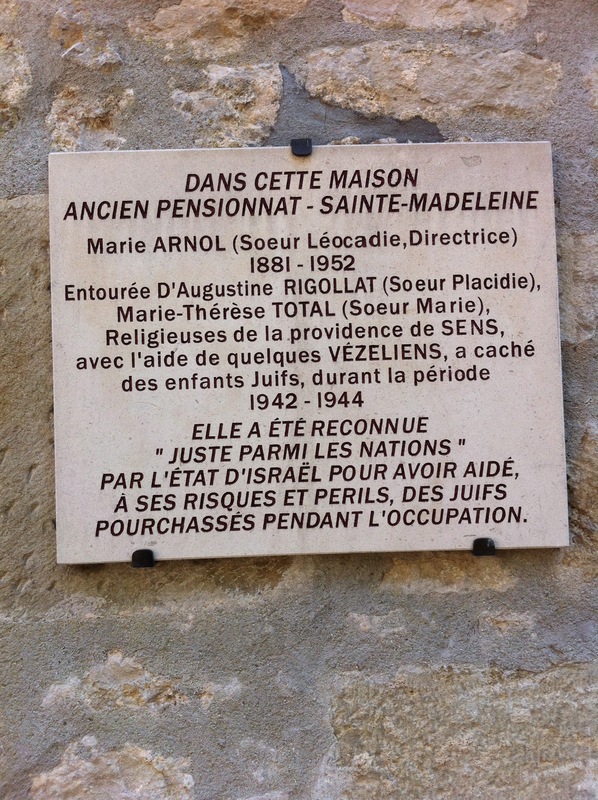 The nuns at Vezelay hid Jewish children from the Nazis. Their courage was recognized by the State of Israel. More mystical for us was the organ concert we went to at the cathedral at Nevers, which emphasized that the natural acoustics of the Gothic cathedral were more impressive than the unused Bose speakers on the walls. 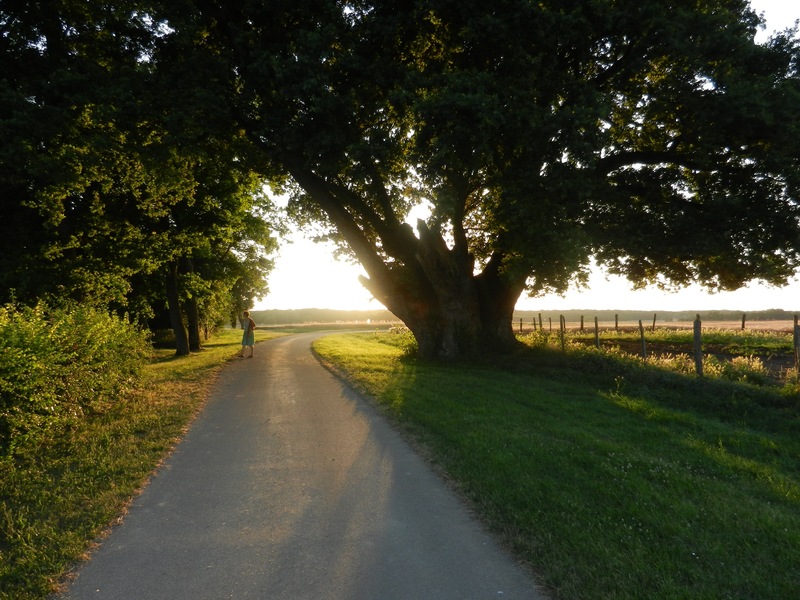 A chance encounter with a family living alongside the canal at La Chapelle Montlinard directed us to follow an old dirt roadway up a hill at sunset to see an 800-year-old oak tree, surrounded by cows. Joan of Arc’s oak tree, the first misstep on her path to being burned at the stake. The legend is that Joan of Arc stood under that tree looking at the medieval city of La Charitee-sur-Loire and swore that she would conquer that rebellious city the next day. 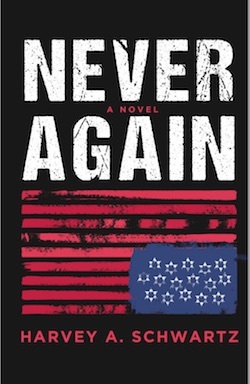 Her army’s failure was the first step on her path toward being burned at the stake. We stood under that same tree, looked at the same city walls, and felt a connection with history, a connection with France, that sent chills down our backs. The cows grazing around the tree shared our feelings. These cows live at the base of Joan of Arc’s 800-year-old oak, as did their great-to-the-20th degree ancestors. Our second summer in France has been a time of revelations and wonder. The pinch-me moments have yet to cease. As the circle closes, our winter return to the States on September 11 approaches. We’ve started planning next summer’s cruise. Alsace-Lorraine. Salzburg. Maybe a visit to Belgium. Love the updates! Especially the oak tree! Enjoy & thanks for blogging! !